QAI’s DevOps services and offerings help organizations automate end-to-end delivery pipeline and facilitate continuous integration and development with an elastic supply of cloud resources. The services promote zero-touch build and deployment, fine-grained service architecture, lean principles and continuous delivery of value. 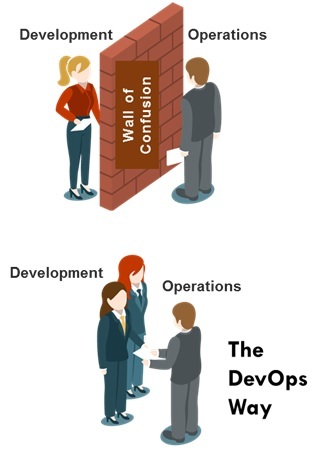 Our certified DevOps consultants mentor organizations to create a culture of cohesive teams with shared objectives, strong source control and embracing failure, recovering automatically, degrading gracefully. QAI offers a suite of training and certification programs for creating the knowledge, skills, behaviours and cultures conducive to successful CI/CD and DevOps implementation. Senior agile coaches engage with organizations to elicit team requirements and decipher skill gaps. Henceforth, experienced trainers accordingly provide trainings, progress people to certifications and provide feedback to management on interventions. Our trainings are accredited from international educational institutions such as DevOps Institute USA and Amazon Web Services among others. Following is a short table depicting some of our trainings under DevOps Leadership Orientation, Awareness Creation, Practitioners Hands-on Customisable Programs, Tool Chain Trainings and Certification Programs. Note: Examples of select training programs mentioned for illustration only. Please request for an exhaustive list of training and certification programs separately.